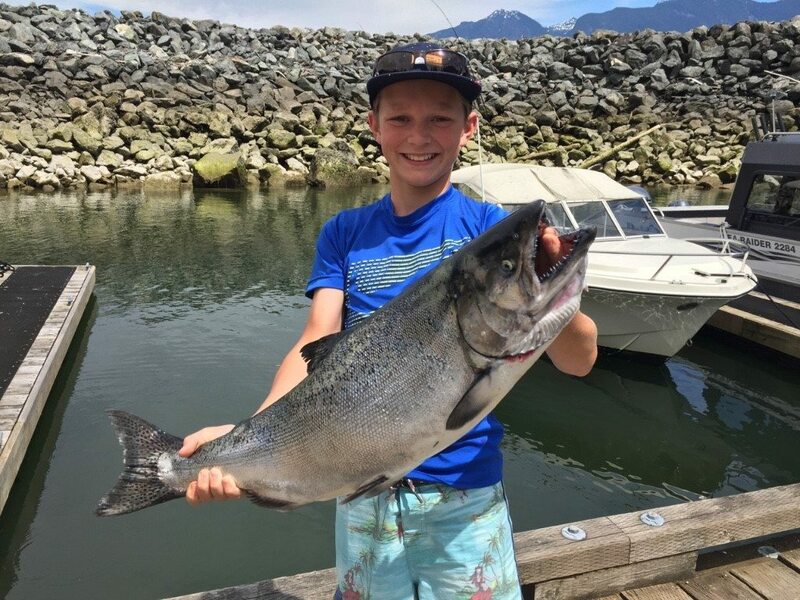 Congratulations to James on his first ever chinook that he caught while fishing with his Dad this past week off Roger Curtis after stopping by Pacific Angler to pick up some new rods and tackle! Happy Canada Day Long Weekend! There is lots going on out in the saltwater this time of year, so let’s get right into it! The coho are in the Cap, if you don’t think so just take a trip to the hatchery and you will see that it is packed with nice size coho and anglers are catching them in the Cable Pool. There hasn’t been much effort by the saltwater anglers off W. Van, but the time to start looking around is right now. There have been a few fish off Point Atkinson, Fisheries, and W. Van. As usual, these early fish don’t hang around too long if the river has decent flow, and right now it does, but it is still worth taking a look around. 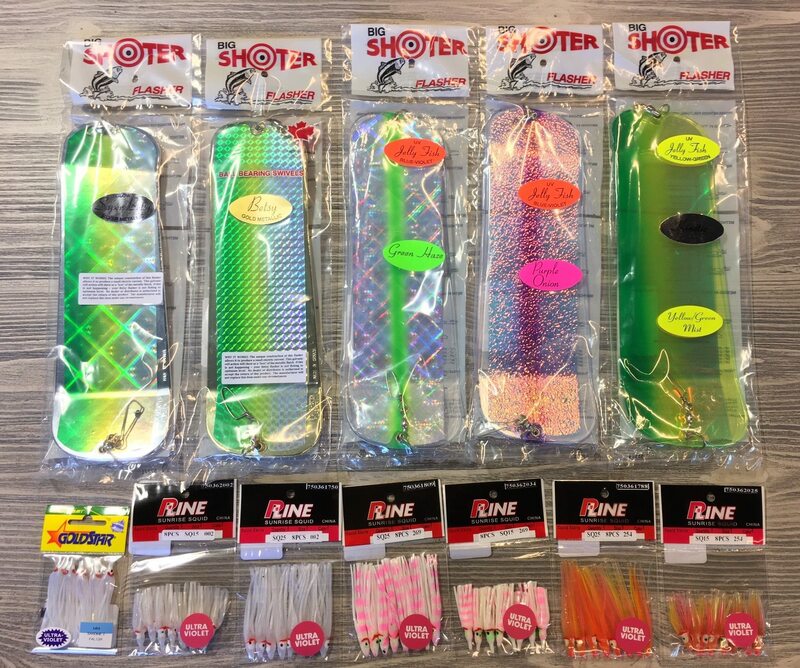 White, white and red, white and pink, and peach colour hootchies on a 28 inch leader to a chrome or UV flasher will get the job done. The fish are generally shallow this time of year, in the top 30 feet of the water column. Sometimes on calm, sunny day they will go a bit deeper, but for the most part fish shallow and expect your best catches to be in the morning or evening. These are some of the top producing flashers and hootchies for Capilano coho. There are still some chinook getting caught off S. Bowen from Cowan Point to Roger Curtis. Bait and spoons fished 60-120 on the riggers with glow flashers on the deeper lines and UV or chrome flasher on the top lines has been the go to tactic for a few months now. There have been a few big fish caught in the last few days and these are very likely Squamish chinook that start to roll into Howe Sound this time of year. Speaking of Howe Sound, Canada Day generally marks the beginning of anglers looking for large Squamish bound fish around Hole in the Wall. This is a hit and miss fishery, so don’t wait for the hot report, as the fishing is often slow by the time you get there. These fish are just stopping by to say hi on their way up the Sound so they are here one day and gone the next. Bait seems to work best and early morning usually sees the best bite. Try as shallow as 45 if you are there first light but for the most part the action is 60-120 on the riggers. It won’t be long before we start hearing of a few chinook off the Bell Buoy as well. This fishery usually picks up around mid July but if you are only out for a few hours this weekend and want a crack at big chinook, try the Bell Buoy, with anchovies or herring, 50-80 on the riggers and you might be surprised. Not many boats have been over at Thrasher in the last 2 weeks of June because of the NW winds, but in recent days we have finally managed to make it across and have had some decent fishing. It is hard to say if this is just a blip on the radar or if it will continue for a few weeks as this time of year it usually slows down off Gabriola. In the meantime we will take these lighter winds and bent rods and keep fishing there until it slows down. The fish have been pretty deep, 170-225 on the riggers with 18 pound cannonballs and glow flashers and glow hootchies are the go to.